How do you do? Mr. Carl Laemmle feels it would be a little unkind to present this picture without just a friendly word of warning: We are about to unfold the story of Frankenstein, a man of science who sought to create a man after his own image without reckoning upon God. It is one of the strangest tales ever told. It deals with the two great mysteries of creation: life and death. I think it will thrill you. It may shock you. It might even horrify you. So, if any of you feel that you do not care to subject your nerves to such a strain, now's your chance to uh, well, — we warned you! Using the carnival sideshow technique of enticing audiences by warning them of the dangers, James Whale's Frankenstein begins in a theatrical and rather endearing way. Only after the creators are absolved of any potential unpleasantness may we continue to the title sequence, complete with elaborate eye-filled background, and the film proper. The only music that appears in the film appears here, in the opening credits, and in the closing credits. This was not the first film adaptation of Mary Shelley's 1818 Gothic novel Frankenstein: or, The Modern Prometheus though it's likely the one that most would recall. Previous films based on Shelley's story were Frankenstein, produced by the Edison Manufacturing Company in 1910 and the lost film Life Without Soul, produced by Ocean Film Corp. in 1915. 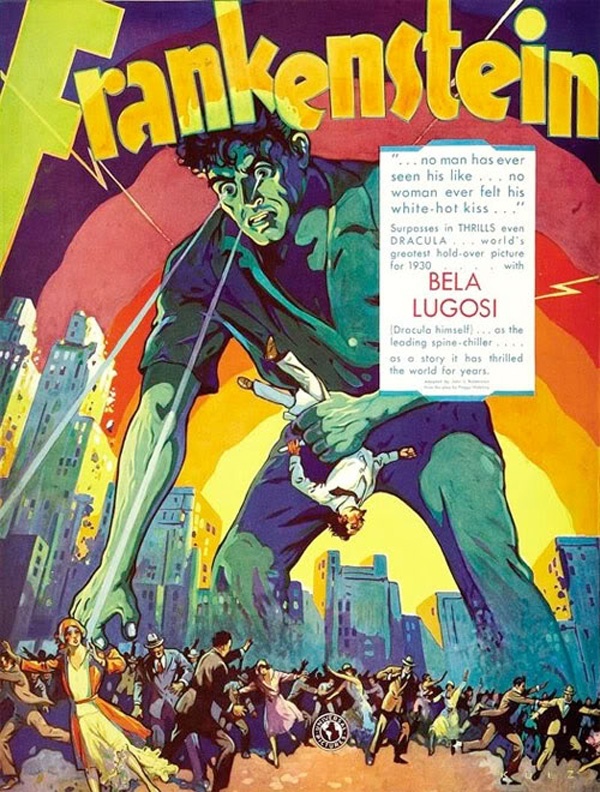 An Italian version called Il Mostro di Frankenstein directed by Eugenio Testa was released in 1920, though it now also appears to be lost. After James Whale's Frankenstein, of course, came numerous film incarnations of the monster. Mary Shelley's name is given in the screen credits as Mrs. Percy B. Shelley. This type of listing may have contributed to many people in her own time improperly attributing the novel to her husband, Percy B. Shelley. As well, the opening screen credits list "The Monster" as played by a question mark. Originally, Bela Lugosi was chosen to play Dr. Frankenstein, but after proving unsuitable for the role, he was "downgraded" to playing the Monster in order to keep his well-known name attached to the project and promotional materials. However, the Monster's character was initially simply a killer with no human qualities. Lugosi reportedly complained, "I was a star in my country and I will not be a scarecrow over here!" and left the project when James Whale stepped in to replace director Robert Florey. In the end credits, it is revealed that Boris Karloff played the central role. 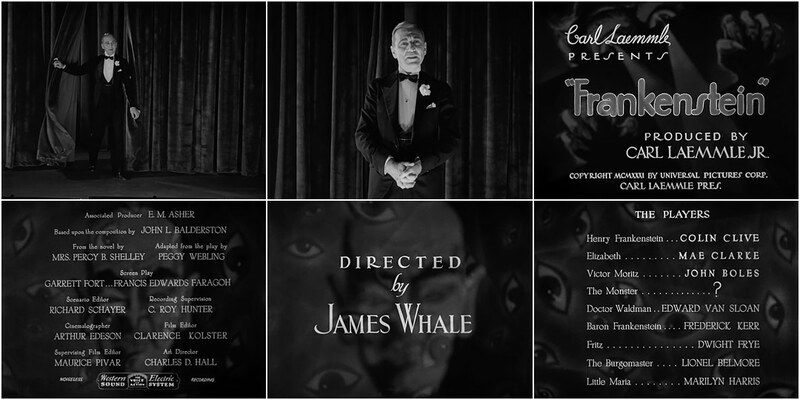 Frankenstein end title cards, with a playful “A good cast is worth repeating” heading. 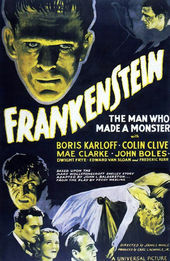 Frankenstein has been hailed as one of the best films of 1931 as well as one of the greatest movies of all time. It holds a 100% "Fresh" rating on review aggregate website Rotten Tomatoes and, in 1991, it was selected for preservation in the United States National Film Registry.